Kalotsavam'12 @ Campbell Heritage Theater on Sunday, May 13 2012. 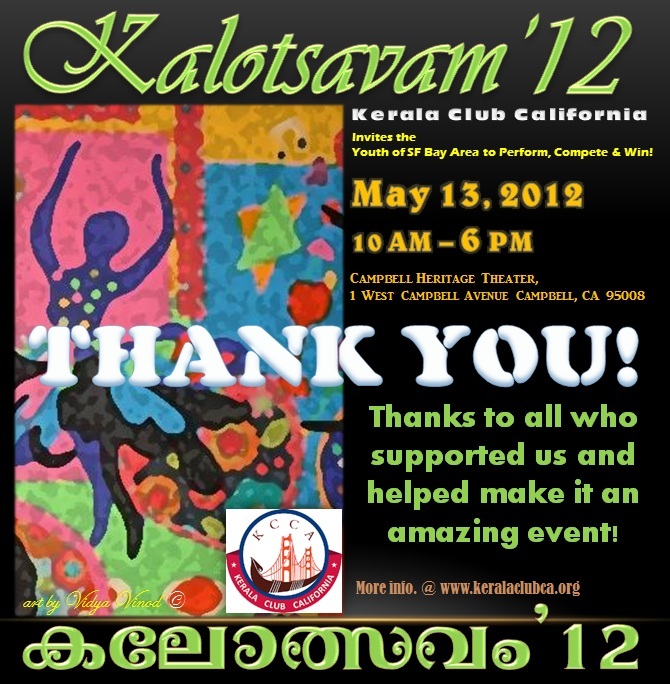 Kerala Club California thanks all the support it received in putting on Kalotsavam'12 on May 13, 2012 at the Campbell Heritage Theater. Pictures, videos and stories from the event will be published on this page shortly. Be sure to "Like" and check out our Facebook page for more pictures and comments! HERE ARE THE RESULTS OF KALOTSAVAM'12! Slideshow of pictures from the event. Call us and make your next catering order! Peacock Restaurants, 6 Bay Area Locations! Call us to set up your next catering order! Zero Costs, Zero Point - Best Rates- Best Service!! Saju Joseph, Realtor | 510-512-3288 | sajujk@yahoo.com Home Buyers will get a Great Discount from My Commission Back Policy.